We have been working with Huddersfield University and Golcar Junior Infant and Nursery and St John's Schools in re-designing this area. The team from the University have started consulting and engaging with us as a group and schools. The idea is that we draw up a plan for this area to help with funding and improvements. We will consult further with the public on Golar Lily day 13th May via a display of the ideas and plans at Manor Road School. Please let me know if you are interested in this project. Marion has kindly taken a lead with this. ​I wanted to say a big thank you to everyone who turned out on Sunday to help with Part 2 of the Clear-out of the Wood - opposite the Colne Valley Museum. 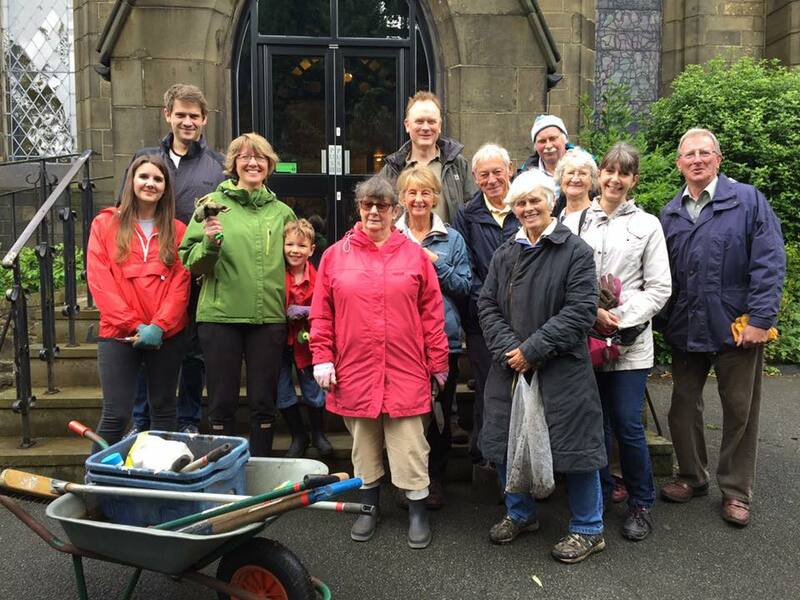 ​We had 15 people throughout the day and 3 new volunteers including our local MP Jason McCartney! It was a very successful and enjoyable day with great sunny weather. The next session will be a 2-3 hour stint - filling another skip with the remaining piles of branches and some tidying up of the pruning that has taken place. We are going to do this on a Saturday morning and need a team of 5-7 people who are willing to get physical! So watch this space for details! A big thank you to everyone who turned out on Sunday to help with the clearing of the triangular shaped wood opposite the museum. What a successful and fun day! We had 22 people help throughout the day with 15 new volunteers! We found the old footpath under the very over grown holly and it is now possible to walk on this - although it is in need of some attention. We even got a write up from the Huddersfield Examiner and a photo! Click here Examiner Write up The plan is to get another date in February to complete clearing this land. You can also find us on Facebook under Golcar Lily Day group where there is a video and photos - please like and share all posts and subscribe to events. The more activity we generate the more likely we are to get sponsorship and attract businesses to help with our work. Betty has decided to step down as chair after 10 years. Betty feels it is time to hand over the reigns. Betty feels happy that the group is thriving and growing and will still remain involved. A huge thank you Betty for all your hard work and energy you have given to our community and this group. Matt has now agreed to step up to the challenge! We are going to be working with Huddersfield University Post Graduate Students in re-designing the space in Golcar Recreational ground (commonly called the Rec!). We will be working with schools, local community groups, churches etc.. to get them to re-design this space. The hope is that we will be able to find some sources of funding and some quick wins to make this area more attractive, usable and suitable to meet the needs of our community. Still yet to be officially launched. A draft pack is completed for comments. If you are interested in adopting a ginnel or helping in setting up this scheme - which would involve the use of a spreadsheet and simple database let me know. ​As you may be aware there is a new group in Golcar the Golcar Lily Environment Group (part of the Golcar Lily Day Team). We have already made an impact with the work we have done such as clearing the ginnels and rejuvenating the flower beds on Town End. We are looking forward to 2017 as we get more projects underway and with this in mind we wanted you to know about the first of these. We are working closely with Kirklees Council to help us manage and restore a triangular shaped piece of land opposite the Colne Valley Museum. This used to be a memorial garden to a councilor called Pat Swallow who passed away some years ago. It is now very overgrown and unloved. We would like to put a footpath back into it as before, tidy it and support nature by adding bird and bat boxes and bug hotels etc. First we need to clear it out and that is where you may be able to help. On 15th January we will start cutting back the overgrown shrubs so we can get a feel for the space. We need some people power. Don't worry if you can't help physically offering hot drinks and nibbles to the workers would be valued. Feel free to drop in and help for as long or as little as you like. Even 30 minutes hard graft can make a big difference any time between 10am and 4pm. If you are able to help, turn up on the day, email us or join in the conversations on our Facebook page. Some tools will be provided but feel free to bring your own. Matt who lives on West End Road is co-ordinating this project so if you know him feel free to contact him directly. You may not be aware but there are lots of groups that help keep our lovely community as clean and tidy as they can, from local residents to Scouts. Could you spare us some time to help out? After 6 years, the original ginnel leaflet, showing the walk around the ginnels of Golcar, finally ran out! With a grant, applied for by Susan Whitwam from the Environment Committee we now have new improved and updated leaflets printed, which are in use and can be picked up in the library and Church. Secondly, in view of the fact that Kirklees has had to curtail many of its gardening responsibilities, the Environment Group has taken over the upkeep of the flower beds bordering the car park on Town End. We planted the car park beds with perennials earlier in summer and they have looked pretty good through summer. Thanks to people living nearby who have weeded and watered. Thirdly, in the light of the loss of habitat from more housing being built, we were granted £250 from the By and Buy Shop to buy wood and fittings to make bird boxes, bug shelters and bird feeders to sell at events. Susan and Geoff Stainton have been very busy making these and if you have not got yours yet look out for them at an event near you. Lastly, there is an exciting project in the pipeline, suggested by a member of the Lily Team, of adopting a ginnel. The idea being, should you live near a ginnel ( or even if you don’t) a family or a small group of willing helpers would make themselves responsible for weeding and litter clearing the chosen area. Anyone who adopts a ginnel will of course be mentioned in despatches! We love our village and want to keep it a great place to live. Please support us in our efforts.